A mom in one of my Facebook groups is — understandably— concerned that her six year old boy is suddenly obsessed with the devil, talking about him constantly, asking lots of questions about the devil, talking about hurting the devil with a sword, comparing other people’s bad behavior to the devil. Is this normal? she wonders. Should she be concerned? Have other mothers experienced this, she asked, and if so what did you do? In another group a mother is concerned because her five year old son can’t seem to tell the difference between Jesus and the superheroes he loves. Jesus is bigger than Batman? What’s his superpower? Can Jesus fly? Can he beat up the bad guys? He’s not interested in prayers or devotional reading. What should she say, what can she do to encourage him to take an interest in God and to participate in family prayers? Small children are very literal, very concrete in their thinking. They aren’t very good at abstraction yet. At five and six they are just beginning to dip their toes into abstract thought and they begin with pretend play. But they’re still pretty literal and black and white and their first forays into abstract thought still are tied to the concrete and are not morally complex. So it’s natural that as they begin to grapple with the huge abstractions of good and evil, as they try to understand why people do bad things, that they think symbolically. The devil is a personification of evil, he’s concrete, a person, something they can grasp as they try to understand evil. And St Michael fighting the devil and driving him out of heaven gives them a concrete way of understanding that Good always conquers Evil. St Michael and other saints with swords are very comforting to children confronting the problem of evil and seem to be very important to young boys. 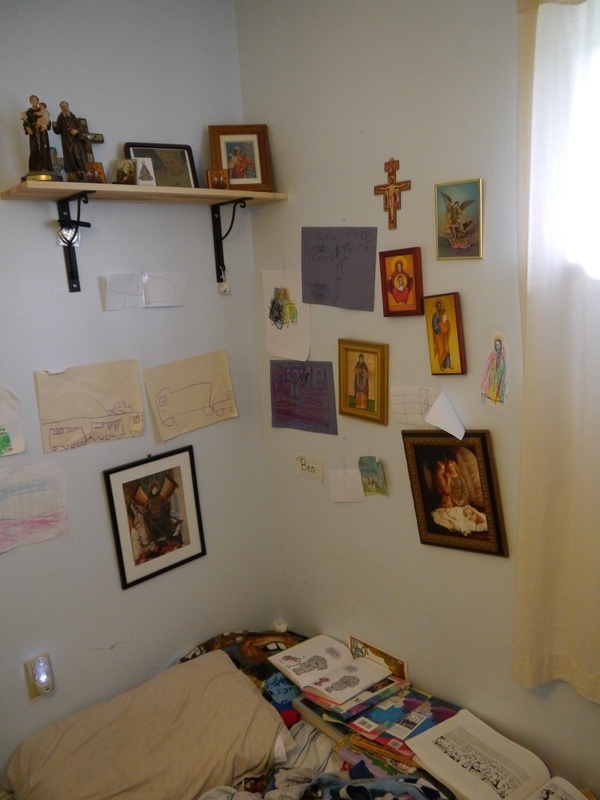 “Dear, St. Michael, guard my room! Don’t let anything eat me or kill me! At that age small children often develop fears of monsters. They imagine things in the closet or under the bed. Sophie was afraid of tigers and bad guys. Ben was afraid of fire. I think the monsters and tigers and other things represent all the dangers they are coming to be aware of. How dangerous this world is. How small and vulnerable they are. And maybe, they begin to understand, there are scary things that even mom and dad are unable to prevent. 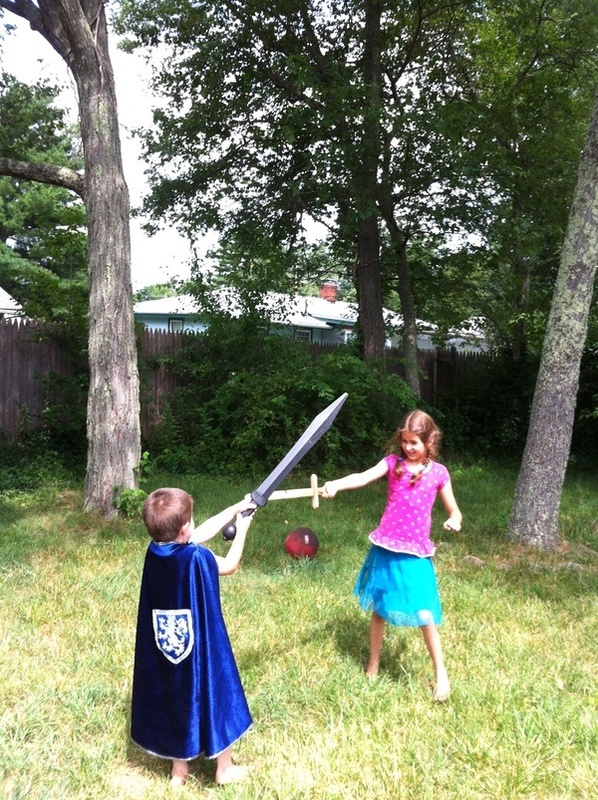 Children need guardian angels and archangels with swords and, lacking a religious formation, superheroes. They need icons of good who are strong and powerful and who always beat the bad guys. For both Ben and Anthony at that age not only St Michael but St George and St Martin of Tours and other saints with swords became very important. 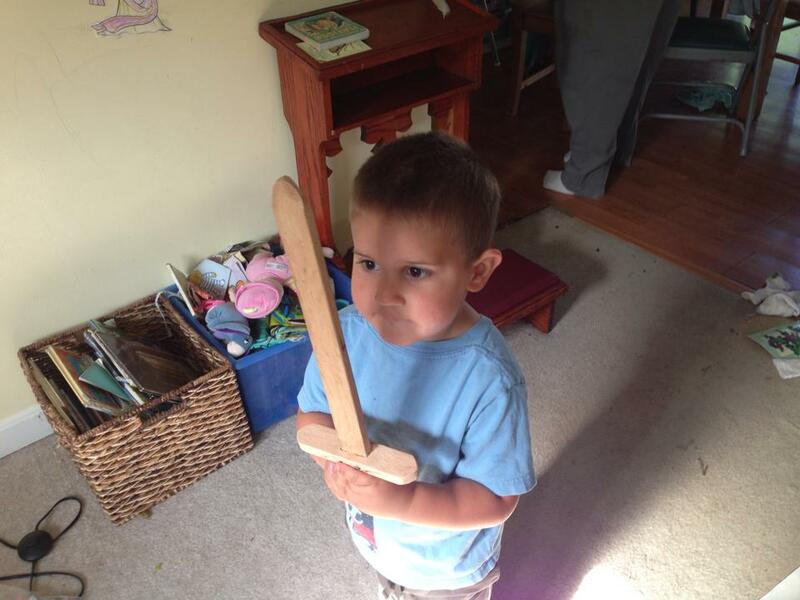 Ben used to flip through various saint books looking for the pictures of the saints who had swords. And even now at eight and having made his first communion, Ben still has a huge devotion to St Michael. 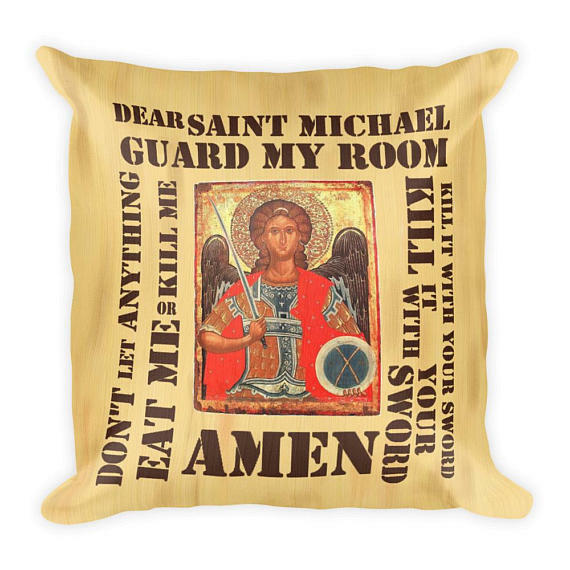 The roots of that go back to when he was a toddler having nightmares and midnight asthma attacks when a picture of Saint Michael and a Saint Michael pillowcase became important nighttime companions. 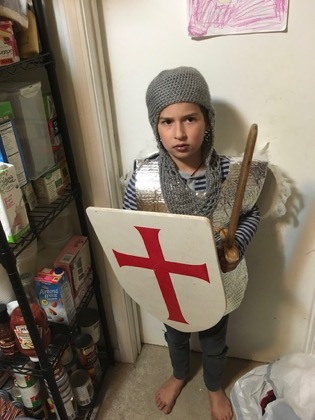 For quite some time Dom and I have been toying with the idea of writing a saints book for boys titled Saints with Swords that highlights those saints that the boys used to hunt for in the saint books and to also include some of the more obscure saints who are also traditionally depicted with swords. 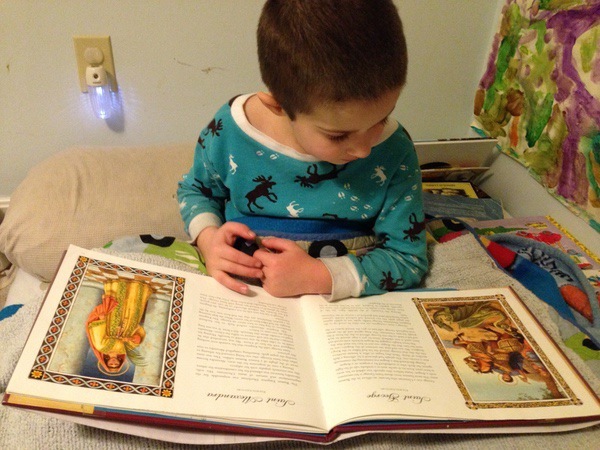 Ben looks at a picture book about the saints, looking for the saints with swords. Corner shelf and images above Ben’s bed. Two different Saint Michael images. About five years ago I wrote a review of a book called Killing Monsters: Why Children Need Fantasy, Super Heroes, and Make-Believe Violence by Gerard Jones that asks why children seem to crave violent stories and games and why they need stories about super heroes who kill monsters. You can see that review here, though at the time I didn’t focus so much on the super hero/monster aspect of the book. But from what I recall the book focused on the universal need to control fear and anxiety and how children are able to face their fears and master them by means of super hero stories and violent games. 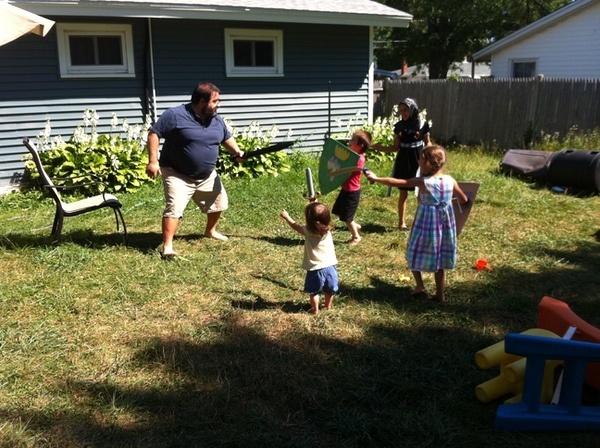 Little boys (and often girls too) will when deprived of toy weapons, turn just about anything into a sword or a gun. Sticks, spoons, pieces of toast, their fingers. In Killing Monsters, Gerard Jones asks what psychological need it is that such play fulfills. He believes that it is tied to a need not to feel powerless, to have a sense of control. 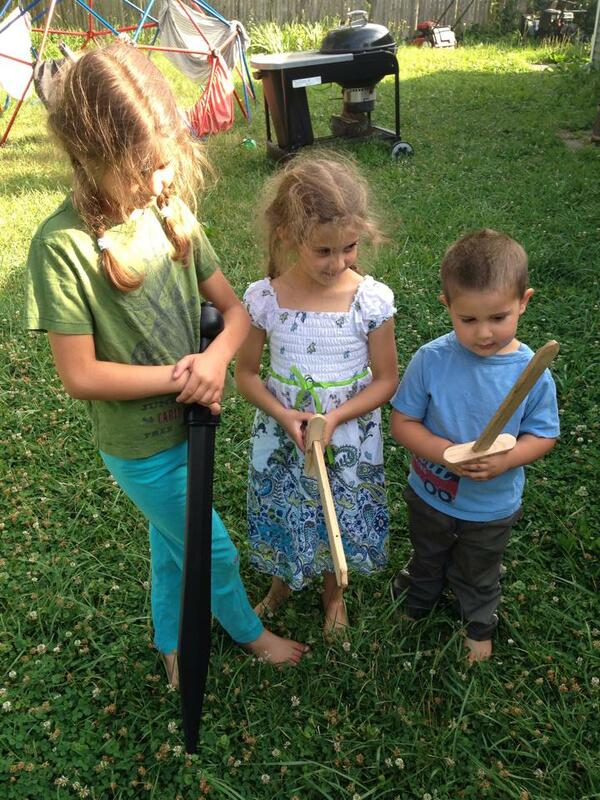 For them the gun or sword isn’t an image of death as it is to adults, but of power and control and safety. If we react with fear and try to deprive them of that tool we may be depriving them of a tool that is in some way necessary to their growth and maturity and well being. We may be depriving them of the ability to face their fears, to kill the monsters that terrify them. And the ability to overcome fear is a good and necessary one. She says she’s the Princess, off to rescue the Queen who is in prison. 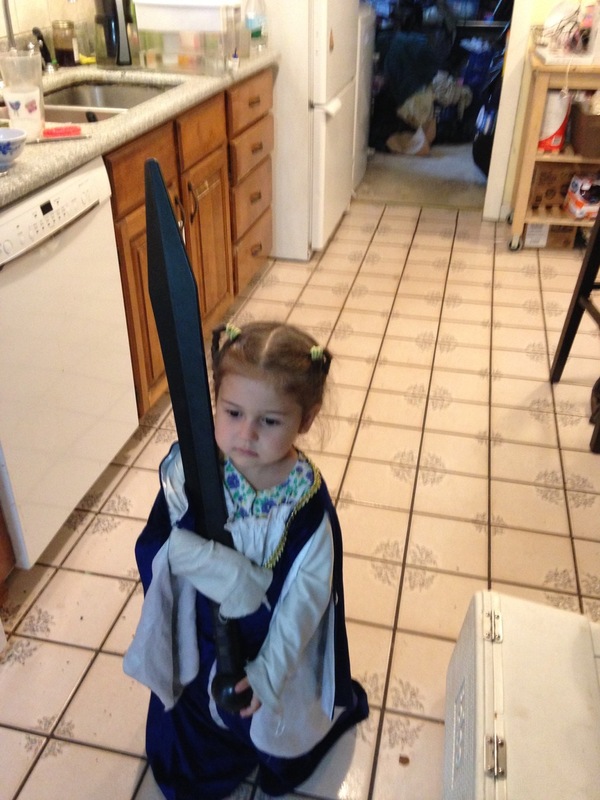 She’s going to kill the guard with her sword. In one of those Facebook conversations one mom speculated that kids need the whole superhero/bad guy story and when they don’t get much TV and are well catechized, the devil becomes the main bad guy. But I’d actually frame that the other way around. Kids need to understand good vs evil and to know that there is hope that evil won’t prevail, that they will be safe and protected, and when they aren’t well catechized and watch a lot of tv superheroes vs bad guys fill that niche. But the more fundamental story is God vs the devil. Superheroes are an echo of that, a reframing of epic good vs evil stories for a modern, atheistic time. Which isn’t to say that superhero stories are bad, but that inasmuch as they are necessary it is because they reflect universal truths of salvation. Christ is the first and best superhero and the others like Batman and Superman and Spiderman (or Hercules and Jason and Odysseus and Aeneas for the ancient Greeks and Romans) etc are good because they either imitate or prefigure his example. Jesus’ death and resurrection is really the ultimate superhero story and it’s our job as parents and catechists to engage the imagination of young children and to help them grapple with these questions. But it’s also ok if at that age they’re drawn more to St Michael or Superman than to Jesus. What they love in Superman, what draws them to his story, is that Superman is a Christ figure. And as for St Michael, his very name means, “Who is like God?” St Michael, like all the saints, always points us to God. 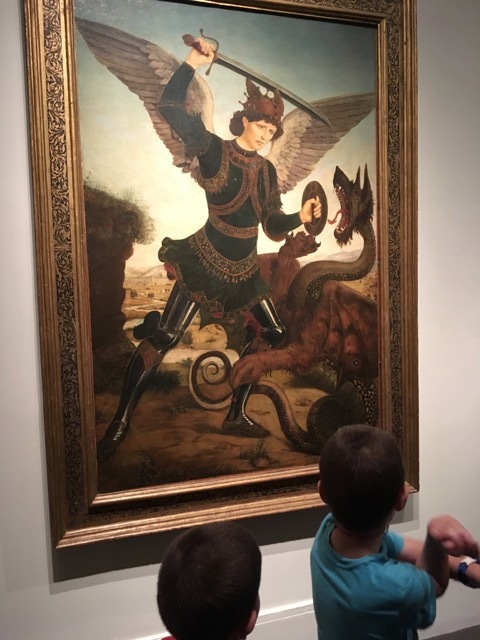 Ben and Anthony loved this St Michael at the MFA. Sometimes it’s hard for very young children to be engaged by the Gospel stories. The Jesus of the Bible isn’t always exciting in the way that will capture their imaginations. But in The Religious Potential of the Child, Sofia Cavaletti writes about their struggles (as they developed the Catechesis of the Good Shepherd) to transmit theology to young children, to get to the essential core of what children need to hear. They tried many different approaches and through trial and error settled on the stories which over and over again seemed to speak to the children’s hearts. What they found was that young children were drawn to the parables of the proclamation of the kingdom and especially to the parable of the Good Shepherd. In this the materials (shepherd, sheep, sheepfold, etc) are clearly not toys but more akin to icons, aids to prayer and contemplation. But I’m really struck by what she says about the child being led not to consider ideas but to know, to encounter a person. Jesus the Good Shepherd isn’t just an abstract idea, a symbol of Good. He is a person, the ultimate Person, one of three Persons in the Trinity. He is Goodness itself, Love itself. Truth and Beauty and Justice and all the abstract ideals and virtues are his very nature and person. He is the Way. And so in contemplating him, the child isn’t moving to the abstract at all, but to the very concrete person who is at the very heart of all good things. Jesus has all the superpowers. He knows everything. He can do everything. He defeated death itself, sin itself. The gates of Hell could not prevail against him. With his great weapon, the cross, he truly defeated the Devil once and for all. In their journey of faith children will advance towards knowledge of God through many different means and superhero stories can definitely be a part of that journey. So can fairy tales and sword play and saints with swords and play with sheep and shepherd and sheepfold. Children learn through stories and through play. It’s no coincidence that Jesus, who told us that to enter the kingdom of heaven we must be like little children, taught through parables and stories. 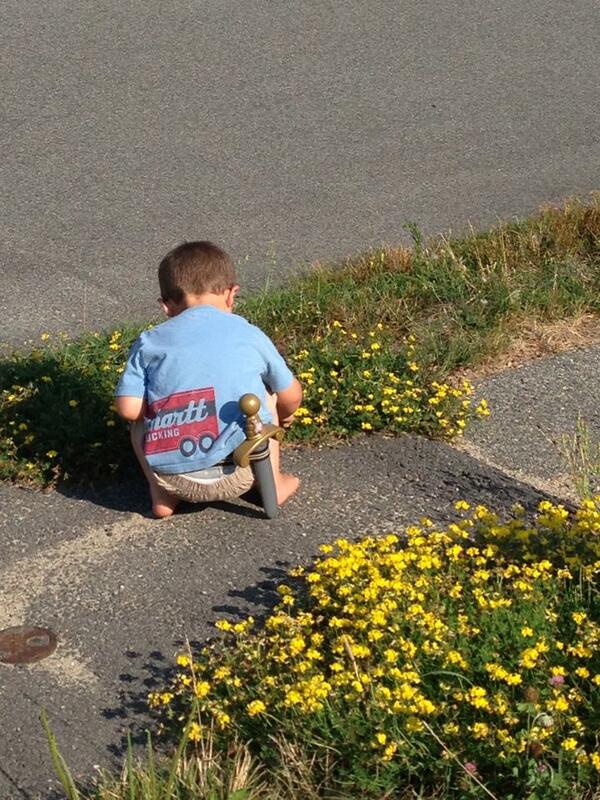 Anthony with sword belt picking flowers. I really appreciate this post. And thanks for sharing that alternative St. Michael prayer.